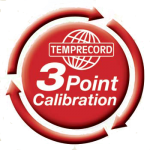 Temprecord is accredited and [authorised] to issue IANZ endorsed calibration certificates for temperature and humidity calibrations for Temprecord data loggers. Note: Temperature and humidity calibrations certificates are issued as a combined or shared certificate, which includes 3-point correction for Temperature and 2-point correction for Humidity. For standard three point temperature calibrations the expanded uncertainty is 0.2 °C over the temperature range from -20 °C to +50 °C, or -40 °C to +50 °C for low temperature loggers. Fahrenheit the expanded uncertainty is 0.36 °F over the temperature range from -4 °F to +122 °F, or -40 °F to +122 °F for low temperature loggers. The temperature scale used is ITS-90. Temperatures values on calibration certificates are printed in degrees Celsius. Temprecord RH loggers are laboratory calibrated with an expanded uncertainty of 3% RH over the humidity range from 12% to 85% RH. The dry bulb temperature range [is 20 °C to 30 °C]. The expanded uncertainty is expressed at a 95% confidence level. The coverage factor is k=2. The calibration laboratory techniques established for Temprecord ISO17025 accreditation have been developed to make 3 Point Calibration a standard process when manufacturing all General Use Scientific and RH data loggers. After initial assembly all General Use, Scientific & RH data loggers are calibrated at -15 °C, 0 °C and +40 °C, or -38 °C, 0 °C and +40 °C for low temperature probes with the option of specified points such as -80 °C. This process provides an accuracy of within 0.2 °C (- 0.36 °F) across a range of -20 °C to +50 °C (-4 °F to +122 °F) or for low temperature probes -40 °C to +50 °C, (-40 °F to +122 °F). 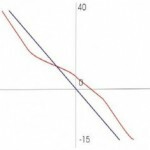 The graph to the left shows how a typical accuracy curve would look like from an un-calibrated data logger. 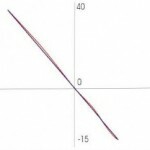 The straight blue line through the middle represents what you would expect true accuracy to look like. From a data logger showing results like this we would re-calibrate the data loggers programming at the three points: -15 °C, 0 °C and +40 °C, or -38 °C, 0 °C and +40 °C for low temperature probes. This second graph shows the accuracy curve after the computer has applied the correction values at each of the three temperature points. As can be seen, this process straightens out the accuracy curve dramatically giving the end-user an accurate product across the stated range. 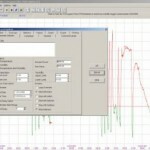 This level of accuracy in the data logger can only be achieved when the data logger’s software has the ability to have these correction factors applied to it. Currently Temprecord is one of the few manufactures in the world that applies the correction data to the individual data logger economically. Some manufacturers do provide calibration certificates but these certificates only provide the correction factors at any nominated points. They cannot make allowances for the correction. Without this, a calibration certificate is only telling you how inaccurate your data logger really is. ± 0.061°C (routinely ±0.2°C from -15 to 40°C) in the F3 machine. ±0.056°C (routinely ±0.2°C from -20 to 50°C) in dry block calibrator. ±0.036°C (routinely ±0.2°C from -20 to 50°C) in stirred liquid baths. ±0.061°C in stirred liquid baths with comm block fitted. ±0.056°C At single temperature points in dry block calibrator. ±0.036°C At single temperature points in stirred liquid baths. Temprecord’s Quality Management System assures that our products conform to the directives established by the European Economic Union and comply with the essential requirements including safety, health, environment, and consumer protection.